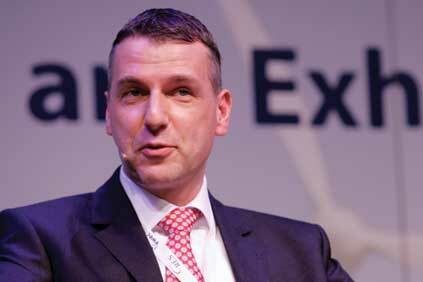 GERMANY: Repower Systems is aiming for double-digit market shares in its core markets, expects to establish a presence in new markets and take "a good number two position" in offshore wind by 2015, CEO Andreas Nauen tells Windpower Monthly in an exclusive interview. The turbine manufacturer hit 21.9% market share in France and 10.1% in the UK, but has to work harder to reach its goal in Italy with 6.7% and in the US with 3.3%. In its home market, Germany, Repower is nearing 10%. The company has recently entered the Australian and Canadian markets and now has New Zealand firmly on its radar. A deal signed last year to supply 48 of its 6.15MW offshore turbines to the Belgian Thornton Bank phase 2 and 3 projects is another step towards fulfilling offshore ambitions. Nauen is reluctant to give specific figures as he gets to grips with the company after taking up the reins in July. "We are in the middle of planning, it's too early to state figures," he says. But it is clear there will be no growth during this financial year, as reported in a statement in December. The company now anticipates total performance of EUR1.25-1.35 billion in 2010-11. This is around 17% or EUR250 million below the previous forecast and on a par with the 2009-10 level of EUR1.3 billion. As a result, turbine production will probably hover at about 1,146MW this business year, in line with 2009-10, and clock in at around 100MW below the 1,253MW achieved in 2008-09. "This doesn't make us happy. But project postponements have happened across the board in France, Italy, Germany, the UK and other markets, mainly due to financing or project planning delays, and in one German case because the site was flooded," Nauen says. He rejects suggestions that Indian loss-making turbine builder Suzlon, which owns 90% of Repower, is holding the company back. He stresses the good relations with Suzlon owner Tulsi Tanti and points to the many things that can be done jointly at the operational level by Suzlon and Repower "without their being one company". In particular, he highlights an internal project set up by the two companies to look at joint procurement. In parallel, in a stand-alone initiative to achieve cost benefits, Repower is seeking to source more components from India and China. Although gearboxes have until now come from suppliers in Europe, including Hansen in Belgium, Repower is now to take gearboxes from Hansen factories in India. Suzlon has a 26% share in Hansen. Repower is also considering sourcing Chinese products through its Chinese joint venture turbine production company, Repower North, for assembly into 2MW machines in Repower's Europe-based factories. Repower plans a new assembly works in Asia in 2011 to serve the Australia, New Zealand and US markets. Nauen says "the location has not yet been decided". However, achieving synergies with Suzlon will play a role. "Suzlon has several factories in Asia, and it's a matter of seeing which is best suited," he adds. Production will start with the 2MW machine. "This represents a cultural change as so far assembly has all been done in Germany." But the German works will not be affected as the Asian factory will serve new demand, he says. Only last year, Repower appointed Suzlon as its sales agent for the US, Australia and New Zealand markets. In Australia, Suzlon is selling Repower 2MW turbines alongside Repower's own subsidiary Repower Australia, which is marketing 2MW - and in future 3MW - machines. After 20 years at Siemens, Nauen says it was time for a change and a key attraction of the role was the opportunity to lead a listed company while remaining in the international wind power business.